Good fathers help their children learn one of the most important lessons in life—respect for women. A good father will treat his wife with the respect she deserves, never standing in her way when she sets out to achieve the goals she has set for herself and contributing equally to the welfare of the household. This will automatically help children learn that men and women are equal and should be treated as such. A good father lays the foundation for a happy life for the child by providing security and stability—physical, financial, and emotional. Seeing one’s father be the problem solver helps inculcate in a child the desire to be a provider, and eventually he or she will gain the self-confidence and belief that no problem is insurmountable, as long as you put in hard work and effort. From giving adequate time to love and pamper the child to being around for important events and milestones, good fathers represent stability in an otherwise chaotic world! Every dad is a hero to his son or daughter. Yet, good fathers recognize that their children must take their own path in life and not simply follow in his footsteps. Smart fathers encourage the child to think independently and to have the courage to hold a different opinion. It is not just about choice of career or other major decisions. Kids who do well in life often have fathers who trusted them to learn from their mistakes and never forced their own rules upon them. Real men don’t feel ashamed to apologize when they commit a mistake. To say sorry means you value the relationship more than your ego and good fathers never use their age or status as an excuse to avoid apologizing. It is natural for a parent to want to protect his/her child from the harsh realities of life. However, life is tough and good fathers teach us that there is no escaping this fact. The lesson, instead, is to never give up hope. To look for a silver lining and stick to it till things start to become good again. We often learn from our father that there are no shortcuts in life. A disciplined lifestyle balancing work and play, increasing wealth through systematic savings, and looking beyond immediate comforts to provide for the future—these are traits all good fathers share. We learn from our fathers that the secret of success is to do those small things as a matter of habit or routine till the goal is achieved. Anybody can be frugal when short of cash. Smart money management is all about spending sensibly when you have lots of cash at your disposal. Good fathers teach this every time they receive an annual bonus or a big payout from a business deal, by celebrating but never wasting. There is a fine line between failing and being a failure. To pull yourself up after every failure and trying again is what life is all about. And who better to help us understand this than our father? Fathers don’t quit. Period. No matter how tough life becomes, they struggle on for the sake of their family until they can take over and ask them to sit back and enjoy life once again. What do kids see when they close their eyes and think of their father? A funny joke that had the entire family in splits? Playing cricket? Having fun in the pool? Or just a smiling face? 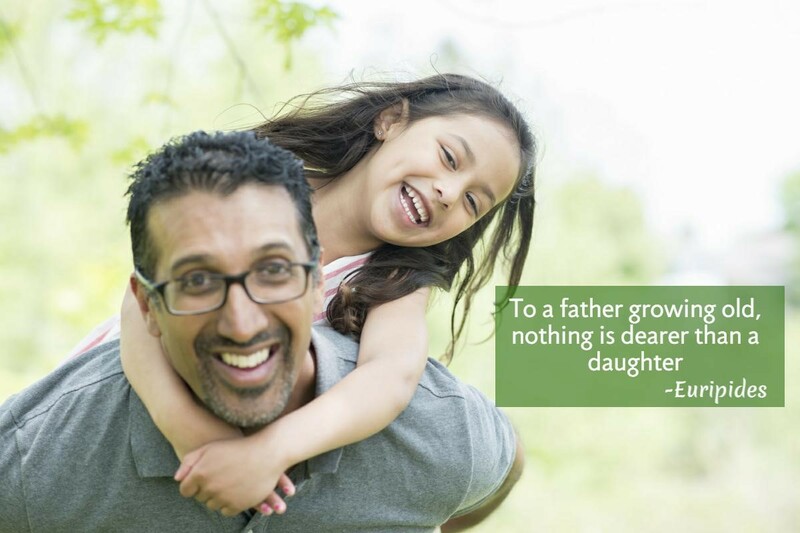 Fathers often find themselves in the role of the disciplinarian, but good fathers understand that life is a lot more than imparting wisdom- it’s about creating a bond with your children that they will cherish for the rest of their lives. If your father did any or all these things, this Father’s Day, let him know how much you appreciate his efforts!